In the hierarchy of beer, few styles are viewed with such apathy by hardened craft beer drinkers as blonde ales; when a beer is low in hops, light in bitterness and economical in aroma, even the quirk of having the lowest possible level of carbohydrates can't mask the fact it pretty much represents pure boredom. But not all blondes are boring. As a counterpoint to ultra low carb blonde beers there are the highly aromatic Belgian style blonde ales and it’s the latter where Stockade’s new beer sits. 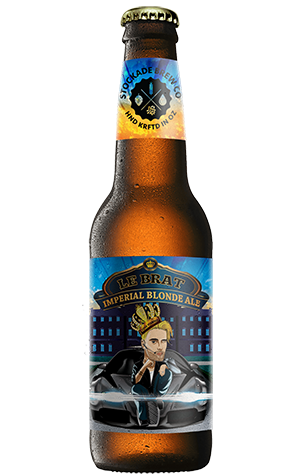 They’ve called it Le Brat and they’ve called it an Imperial Blonde Ale which, at seven percent ABV, is certainly far more than your average Aussie blonde, though comfortably within the sweet spot for Belgian interpretations. While crystal clear, inarguably clean and refreshingly crisp, it's got character well beyond what you might normally expect of a beer with those descriptors applied. That’s mainly thanks to the work of the yeast, which has banana aromas soaring from the glass, along with a hint of clove spiciness. The crown wearing figure on the bottle may proffer an image of a beer that’s been suited up somewhere between Tarocash and Euro-trash, but Le Brat is a surprisingly sophisticated wee number.